Chihiro is moving and she isn’t happy. Despite her parent’s upbeat spin on their relocation, she is sad and resentful at having to leave her friends. On the journey to her new home, Chihiro and her parents stop to look at their new surroundings. Much to her dismay, they start to explore an abandoned theme park. However, all is not what it seems and Chihiro’s mother and father are bewitched by the inhabitants of the spirit world. Chihiro, with the help of a mysterious boy named Haku, must risk everything to rescue her parents - before it is too late. Click Here To Receive Our Weekly Newsletter! I have to admit that I am a latecomer to the Studio Ghibli party. While I have been long aware of Japan's acclaimed animation studio, I had not watched any of its acclaimed films. This all changed last year when I watched Hayao Miyazaki’s My Neighbor Totoro. I fell in love with this movie - in fact my entire family fell in love with this movie. I am now working my way through Studio Ghibli’s back catalogue and enjoying every minute. I have watched Ponyo, The Tale Of The Princess Kaguya and Howl’s Moving Castle and I was so looking forward to Spirited Away. 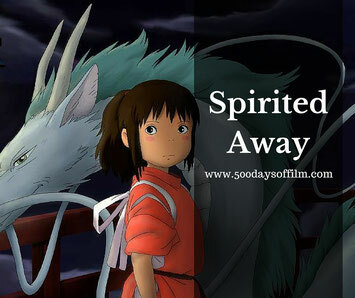 Spirited Away won the Oscar for best animated feature in 2003. You can certainly understand why. It looks beautiful - the animators have paid so much attention to detail that everything feels real. Spirited Away also feels eerie and strange - a visual style that is a perfect fit for the movie’s beautiful, eerie and strange story. I love the fact that Miyazaki always includes strong females (both good and bad) in his films. Chihiro is such a wonderful character. She is funny, feisty and ultimately pure of heart. This serves her well as she negotiates the bizarre and nightmarish spirit world. Chihiro meets a number of strange and wondrous creatures. All of them are interesting, engaging and created with just so much imagination. I did start to wonder what it would be like to peak inside Miyazak’s head (Inside Out style!). It must be a strange and fabulous place in there! Chihiro encounters many points of peril in Spirited Away. The story and its animation feels quite unnerving and intense at times. For this reason, I would caution against very young children watching this film. There is no violence or bad language of course, just a series of unsettling and mildly scary scenes that could prove too much. I loved Spirited Away. It cannot unseat My Neighbor Totoro in my heart but it is no less a phenomenal piece of animation and storytelling for that. Have you seen Spirited Away? What did you think of this Studio Ghibli film? I’d love to know - do leave me a comment in the box below.